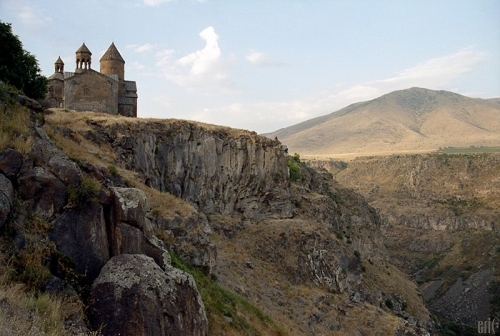 The monastery complexes of Hovhannavank and Saghmosavank are five kilometers apart and situated in the villages of the same names of the Ashtarak district. Both monuments perch on the edge of the precipitous gorge of the Kasakh river. Their silhouettes dominate the adjacent villages and rise sharp against the background of the mountains crowned by Mt. Aragats. The main temples of the monasteries erected by Prince Vache Vachutyan — the Church of Zion in Saghmosavank (1215) and the Church of Karapet in Hovhannavank (1216— 1221) belong to the same type of cross-winged domed structure with two-floor annexes in all the corners of the building. Subcupola space predominates in the interiors of both churches, which is reflected in the exterior shapes of these structures. The book repository of Saghmosavank, built in 1255 under Prince Kurd Vachutyan is among Armenia's buildings rare in their purpose and original in their composition. The book repository communicates, through doors, with the vestry and church of Astvatsatsin (1235) to which one can get only through the book depository. This circumstance, as well as the existence of the altar apse, suggest that the building was intended for depositing not only manuscripts, but precious church-plate as well. The architectural ensembles of Hovhannavank and Saghmosavank are distinguished by a compact arrangement of the monuments around the main building. The clever use of the terrain (the eastern walls of the churches verge on the edge of the precipice and seem to be an extension of it) adds to the picturesqueness of the complexes which are especially expressive when viewed from the opposite side of the Kasakh river canyon. The decoration of the monuments is well thought-out. The southern and western facades, facing the approachways and well illuminated by the sun are decorated more lavishly than the eastern and, especially, northern ones, which look very modest in comparison.